Start off 2016 right with a super healthy + no added sugar smoothie! Sally’s Baking Addiction is an amazing food blog, so I knew I had to give her Superfood Power Smoothie a try when I saw it! There’s something about the layered look that’s enticing, and I can confirm now that the layers were delicious (using spinach was also an added bonus)! We made substitutions based on our preferences and what we had on hand. For example, we used pomegranate instead of strawberries for the pink layer and it turned out great! We also experimented with a third and even a fourth layer – using blueberries and then coconut. 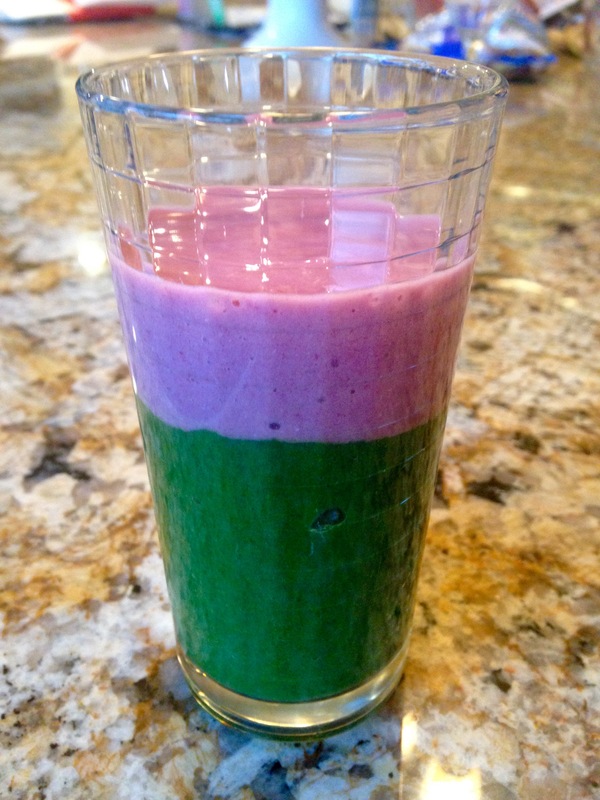 If you’re making this smoothie, take your pictures fast since some of our layers ended up blending fairly quickly! Since they were a huge hit, we knew we had to step up our game and try our hand at something even more complex: Roly-Poly Santa Cookies! Pre-baking. Protip: To ensure that the pieces all stay together after baking, try to connect the arms with the faces more before baking. Another protip: We made powdered sugar by blending regular sugar, but we may have needed to blend the sugar more since we didn’t really get a powdery texture in our frosting. After we reveled in our glorious accomplishment, I took home the pound of extra frosting we made and decided to bake gingerbread cookies the day after at another friend’s place. But this time, we couldn’t find gingerbread cookie cutters anywhere. It’s like all the stores said move over, Christmas, and cleared out everything for whatever else is coming. So we settled for “bunny” and “dog” cookie cutters which were the only options. When we actually got to cutting the dough, we felt that our bunny and dog cookie cutters were too big so we ended up making circles, which created about 45 cookies! 45! I guess you could say we baked up a storm. Quite the baking adventure, but I’m already looking forward to what 2016 baking has in store. Get ready, Pinterest. This post is long overdue, but I had the pleasure of hosting a few friends over at my apartment for dinner a few weeks ago…which meant lots of cooking! This was my first time throwing a dinner party on my own – I definitely underestimated how much time cooking would take and scrapped ambitious plans to bake a dessert, but hey, it was worth it. Heat up a pan with olive oil, and once hot, add minced garlic (as much or little as you’d like with the amount of spinach you use). 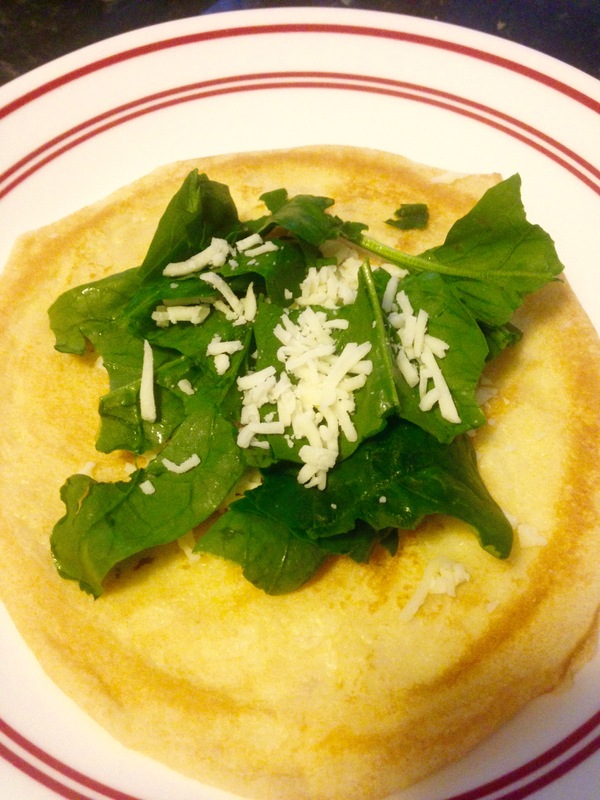 Cook the spinach thoroughly, and continue to drizzle with olive oil, curry powder, red chili, and salt. And voila, we have a tasty home-cooked meal! As a farewell to fall and hello to winter, I made these yummy Pumpkin-Banana (eggless) Muffins the other day. When I make these next time, I’d probably add a bit more spice than what the recipe calls for for a stronger taste. If you’re feeling like you really want to load up on the sweet, definitely consider topping these muffins with frosting (I just used store bought)! After all, muffins are healthier than cupcakes…right? This Thanksgiving, I decided to jump on the pumpkin bandwagon (a bit late I know) and try my hand at some pumpkin desserts. If you ever need to whip up a dessert in less than hour, this is the recipe for you: Vegan (well except for the chocolate chips) Pumpkin Chocolate Chip Bars. No eggs and no mess! 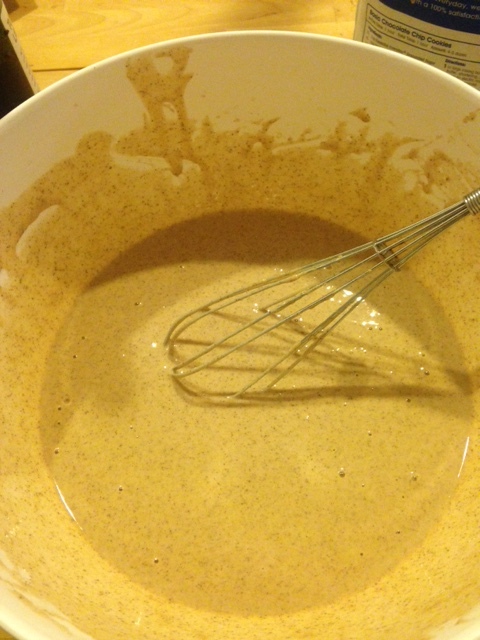 I didn’t have pumpkin spice, so I just ground cinnamon sticks, cloves, nutmeg, and ginger into a powdered form – didn’t explicitly follow any proportions but used cinnamon more than the other spices. The end result is a pie of chocolatey – pumpkin goodness, with the flavors of fall reminding you of your daily pumpkin-spiced latte. Definitely an easy recipe I’ll be keeping in my back pocket! Cut this into bite-size pieces! 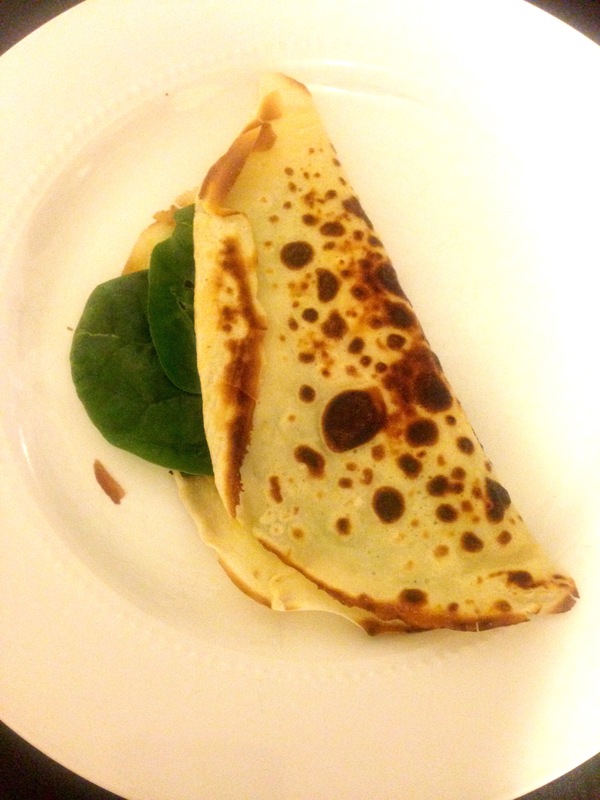 This past weekend, R and I decided to have some fun and make crêpes! It of course helped that she’s a killer cook and Parisian, but the recipe actually turned out to be much easier that I thought it would be. We followed the general gist of this recipe for the batter and let it sit in the fridge for 40 minutes before making the crêpes. Once you’ve heated the pan and spread some butter, take a scoop of the batter and pour on to the pan, quickly making sure to twist the pan right and left to ensure the batter covers the whole pan. 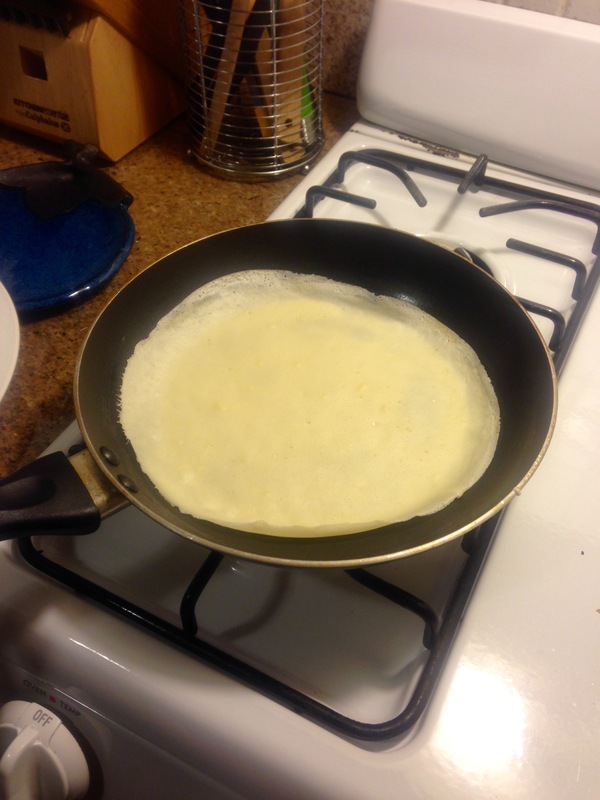 You’ll notice that the edges will start to lift upwards after a minute or two, and then you can flip the crêpe. Once it’s fully cooked, lift out of the pan and make the next one! 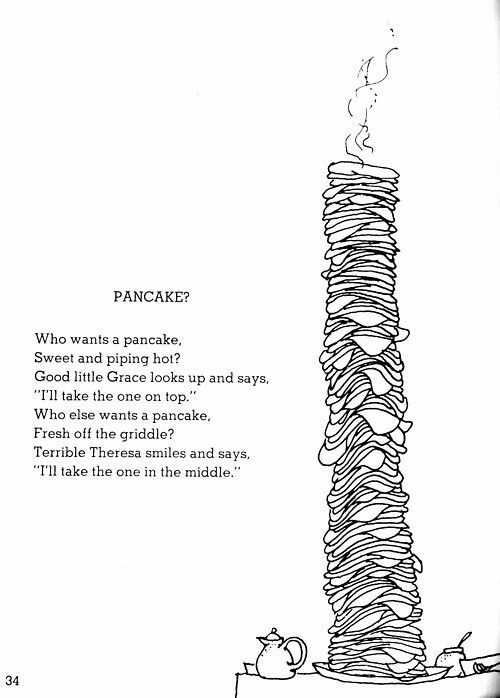 If I Call You Darling, Will You Make Me Pancakes? 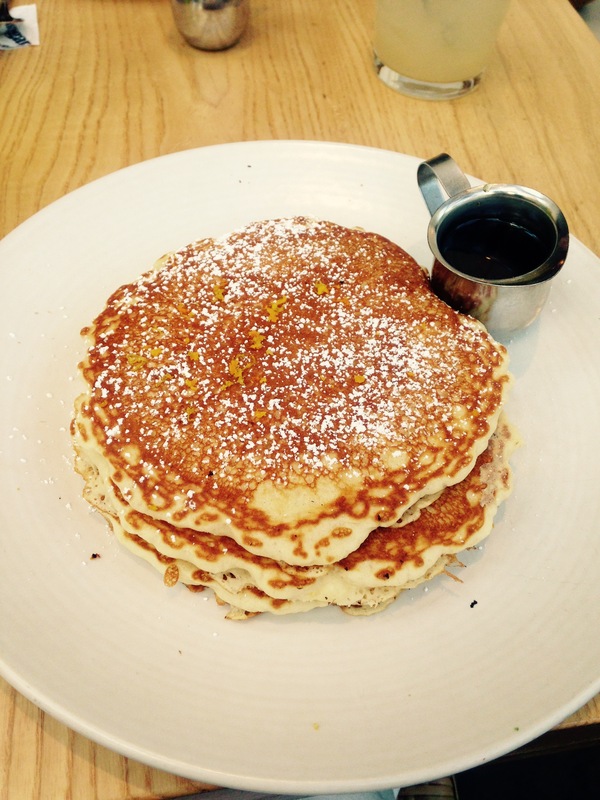 I had the orange-chocolate chip pancakes at Summer House Santa Monica a few weeks ago and can definitely say they were the best pancakes I’ve ever had. The texture was just right – not too soggy – and the combination of citrus and sweet was to die for. Summer House Santa Monica is themed as a ~California chill~ restaurant, and I’ve got to say, the orange in these pancakes definitely adds to the vibe. Worth a try if you’re into sweet over savory brunch. Here’s a recipe from Two Peas & Their Pod for the DIY folks! 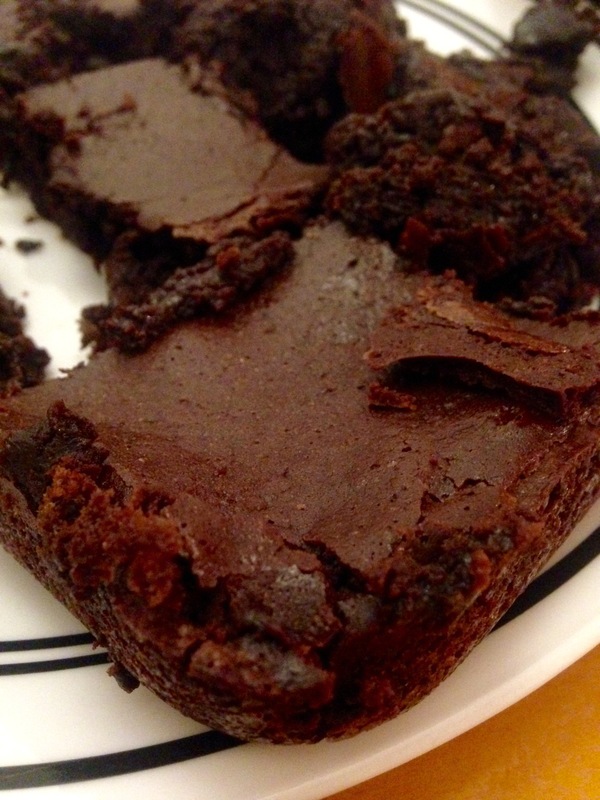 Watch out – some decadent brownies coming your way. 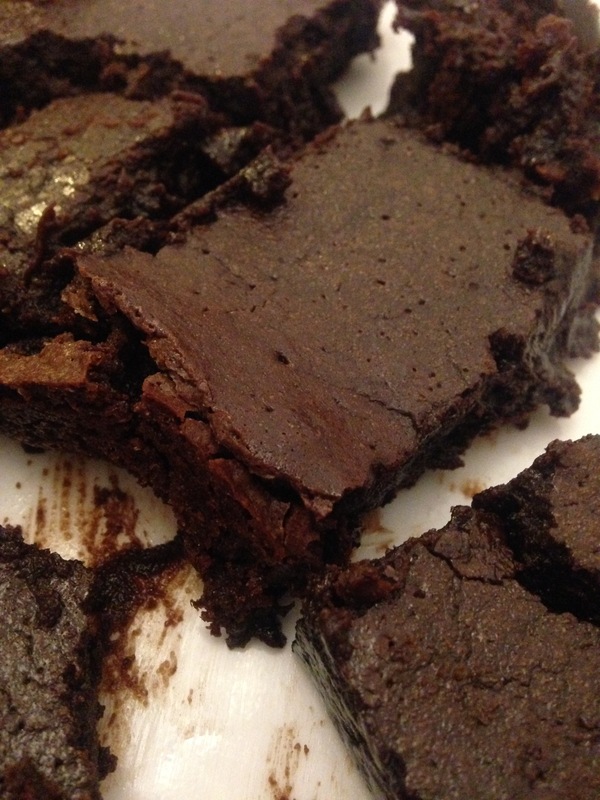 These Browned Butter and Red Wine Brownies might just be the best you’ll ever see. One thing I will admit though, is that I still don’t really understand “Browned Butter.” When we melted the butter in a saucepan and let it heat, it never really turned reddish brown like it was supposed to. The milk solids did separate from the fat (I think? 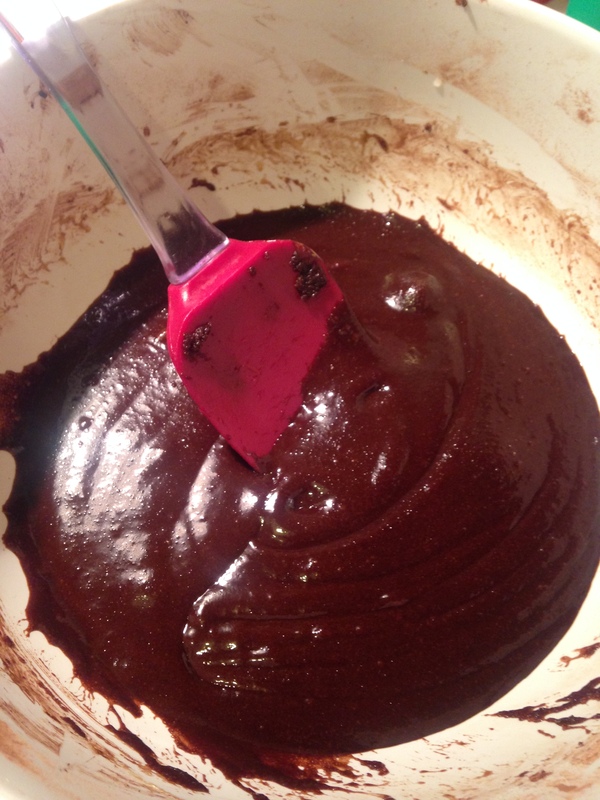 ), but that was kind of it… if the same thing happens to you, just make a judgment call after 10 minutes or so since our brownies still came out amazingly well. 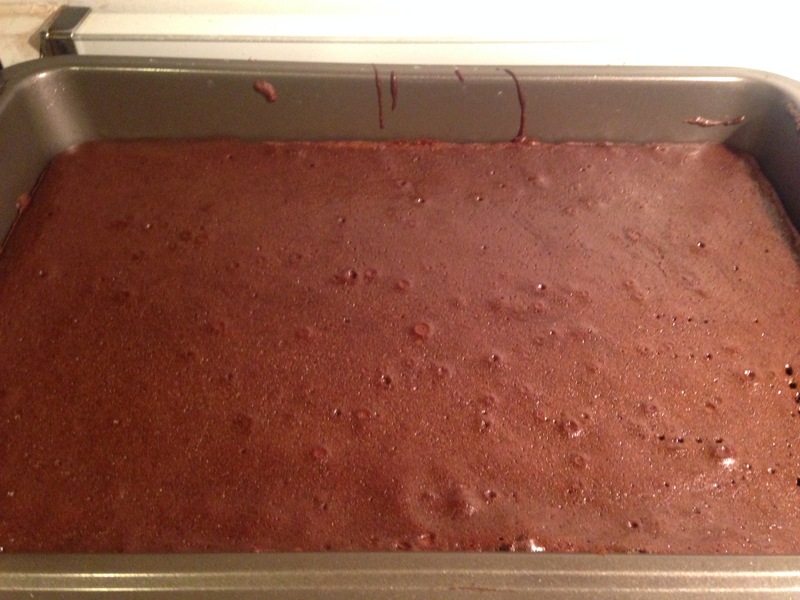 We also doubled the proportions here so that our brownies would come out thicker – with our standard pan, following the proportions suggested by the recipe would have yielded very thin brownies. Definitely a fun recipe to try and I can promise you’ll be in for a real treat! 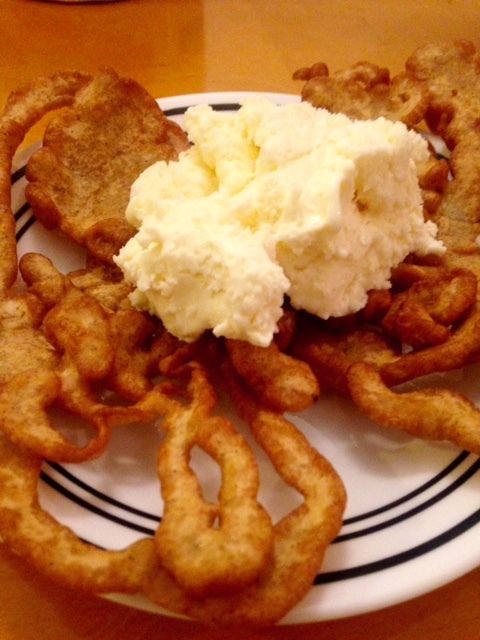 Who ever thought that making funnel cakes at home would actually be easy? 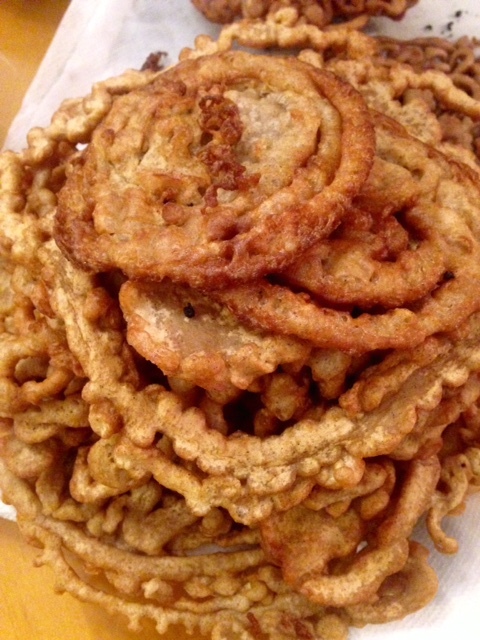 Edit: APPLE CIDER funnel cakes. Quite a fall treat. When I moved into my apartment, I noticed my roommate had bought a red plastic funnel. And I remember wondering when we would actually use it. Well, the day came when K and I decided to experiment and make our carnival dreams a reality using this Dine & Dish recipe. First hurdle: making a substitute for Allspice. We ground up cinnamon and cloves (didn’t have nutmeg unfortunately) which seemed to work. 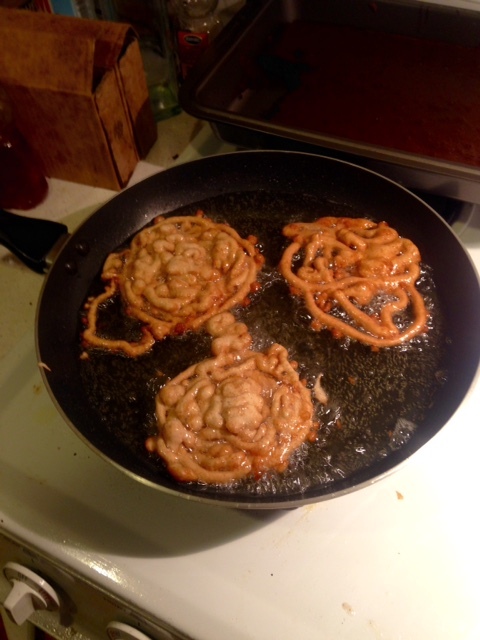 Once you’ve got the batter ready and the oil heated comes the fun part: making your funnel cakes. 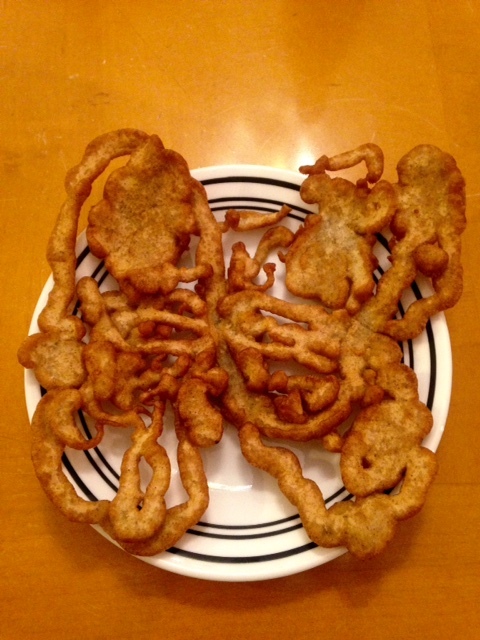 Using the funnel / makeshift funnel, create cool shapes in the pan and flip with tongs. You can make several small cakes or one big one (note that bigger ones are harder to flip). We went all out and probably made over 20 (see the mountain of cakes below). The apple cider and cinnamon added a really nice touch, though the taste isn’t as strong as you’d expect it to be. It’s also recommended that you eat the funnel cakes soon after they’re done so that they’re still hot and don’t become soggy. Topping the cakes with ice cream is also the power move here. Final tip: Don’t try substituting apple cider for anything else without seeing if it’s been done before…we tried that and let’s just say it didn’t come out so splendid. This calls for a carnival party, right? 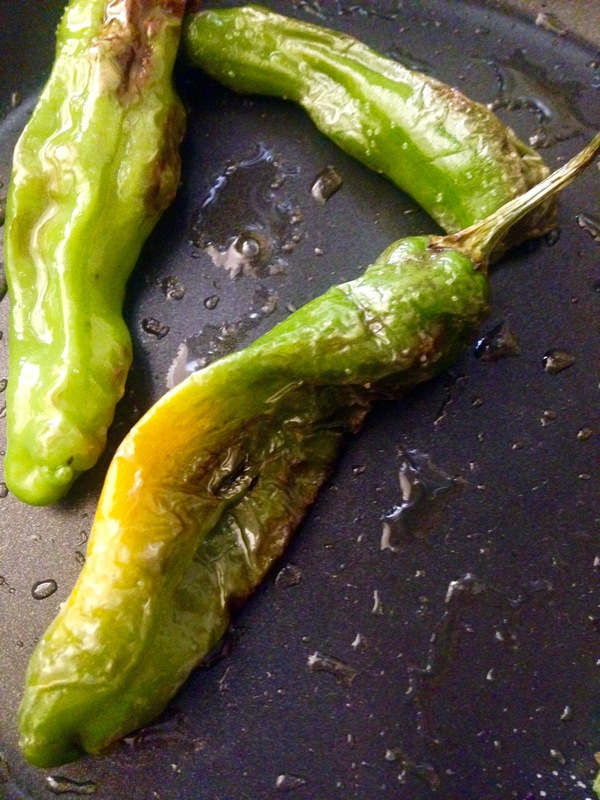 It’s been a while…but I’m well, alive, and sharing with you my discovery of shishito peppers! I watch him as he sautees these peppers for a pre-lunch snack and I’m skeptical – rightfully so, since my dad usually underestimates things like the time it’ll take to get somewhere or how spicy something is. Well, I didn’t try the peppers that time but I decided to give it a go the next time we made them. And I was amazed. Once they blister, add salt and wait for them to cool before taking a bite. Sweet, but not too sweet, the perfect summertime snack. When allowed to fully ripen on the plant Shishitos will turn a vibrant red and their walls will be thicker fleshed. Originating in Japan the Shishito pepper is believed to have gotten its name from its tip end which to some resembles the head of a lion or in Japanese, shishi.